Shortly after, I discovered Milton Caniff’s Terry and the Pirates and other classic adventure strips in some books on the history of comics and the earliest collections of the series from Nostalgia Press. Using the same character name as my Sgt. Hanes series, I created private eye Rob Hanes as as a potential syndicated adventure strip, hoping to follow in Caniff’s footsteps, even creating very crude sample strips that I submitted to syndicates. Though the series has evolved since then, his agency, Justice International, was there at the very beginning. (And in case you’re wondering, in this universe, Rob is Sgt. Hanes’ nephew, and I’ve always planned to one day feature the character in the series.) By the late 1970s, however, the newspaper adventure strip genre was all but dead, so the character went nowhere. All through college, I continued to draw and develop the character, keeping sketchbooks and story ideas. Following college in the ‘80s, I began to develop the character as a potential comic-book series. By this time, the independent and black and white comics revolution was in full swing, with series like Cerebus the Aardvark, Usugai Yojimbo, and American Flagg! showing the viability of alternative comics. It was only around this time that I began writing and drawing stories for print and showing the series to potential publishers. Though these early efforts were pretty crude, I actually met with a fairly positive response when I began submitting the work to potential publishers. First among them was early independent publisher Renegade Press, which publicly announced the series. However, in what would be a recurring example of bad timing for me and the series, Renegade closed its doors shortly before the first issue went to press. I soon after teamed with a nascent publisher, Brave New Words, which in 1990 released Rob Hanes #1. Brave New Words, too, soon closed its doors. 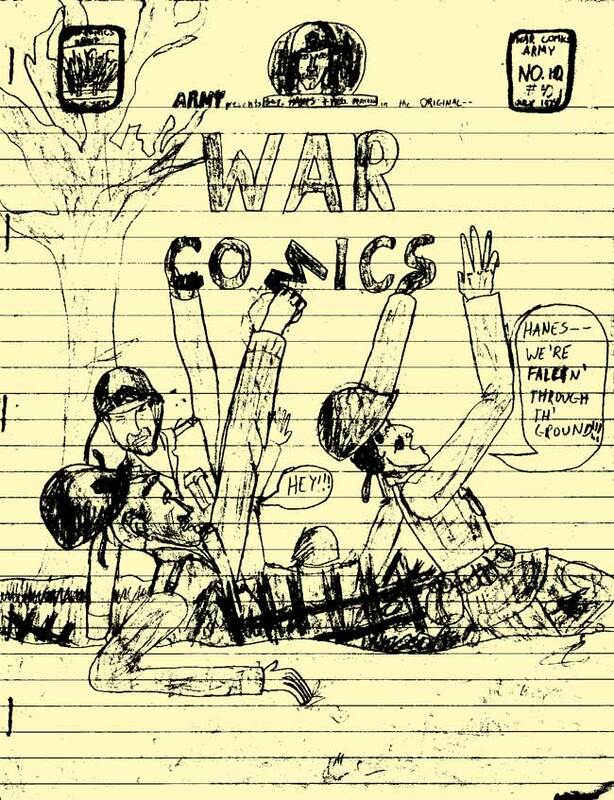 Around this time, I stumbled across the small press comics zine community which, in those pre-Internet days, primarily conducted business via mail order and was comprised of a small community of comics fans and aspiring creators. I began publishing the series as a small press zine called Adventure Strip Digest, and quickly gained some recognition for the work. In those days, the small press comics community was a much smaller pond full of enthusiastic comics fans and creators who were very responsive to other people’s work. Publishing the book as a small press digest/zine gave me an easy outlet for publishing the work while developing as an artist—you can really see the growth of my work from issue to issue during this time. I also began to achieve some recognition in the mainstream, partly because I was sending copies of my small press work to professionals and comics companies I admired. With the self-publisher boom now in full-swing with titles like Jeff Smith’s Bone and Batton Lash’s Wolff and Byrd, Counselors of the Macabre (now Supernatural Law), based on the response to the small press series, I entered the direct-market sales fray with Adventure Strip Digest as a full-sized comic-book in 1994 (which is the 20th anniversary I’m marking this year). This series ran four issues, with issue 4 appearing in 1996. 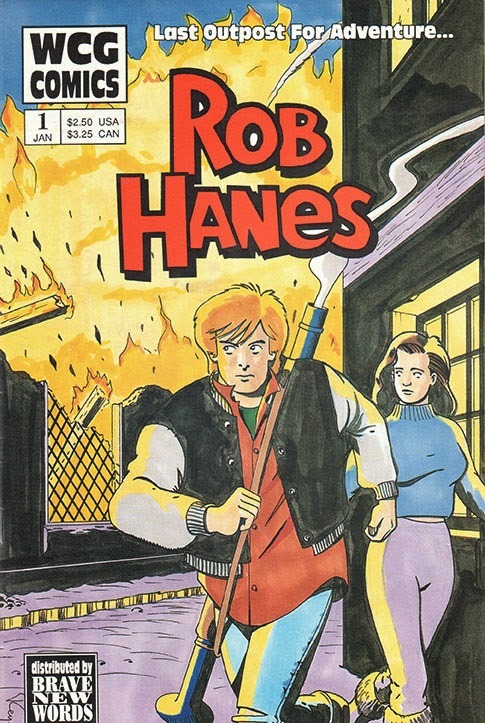 That year also saw the release of the Rob Hanes Archives, a 120-page trade paperback that collected in one volume all of the adventures that appeared in the earlier zine series, funded by a grant from the Xeric Foundation, which was founded by Peter Laird, co-creator of the Teenage Mutant Ninja Turtles, for the purpose of providing grants for self-publishers. 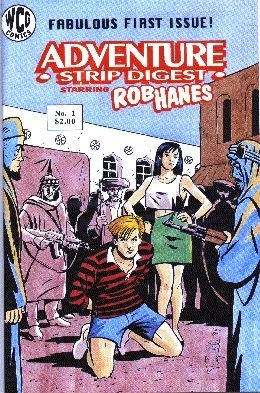 After a hiatus and some talks along the way with mainstream publishers, including Image Comics and Caliber, I re-launched the series in 2000 as Rob Hanes Adventures, under the WCG Comics banner. Since then, 15 issues of the series to date have been released, as well as another trade paperback collection, Rob Hanes Adventures, Vol. 0, which collects in one volume the original four-issue run of Adventure Strip Digest. Though in 20 years this may not seem like much of an output, I’m still proud of the body of work I’ve created, representing a singular commitment to an ongoing series that I think is unique for an independent comic-book series. I’m proud to say that I’ve built a solid fanbase of readers (which extends internationally) who regularly follow the series and patiently look forward to each issue. In return, I’ve made it a point to make each issue complete and self-contained so that readers are never left hanging between issues and can pick up the series at any point. With more than 30 stories totaling more than 500 pages produced to date, stories have focused primarily on “done-in-one” adventures that have taken the character from one global hotspot to another. Rob’s adventures have taken him to the Middle East, Eastern Europe, Japan, Russia, China, North Korea, and Europe. 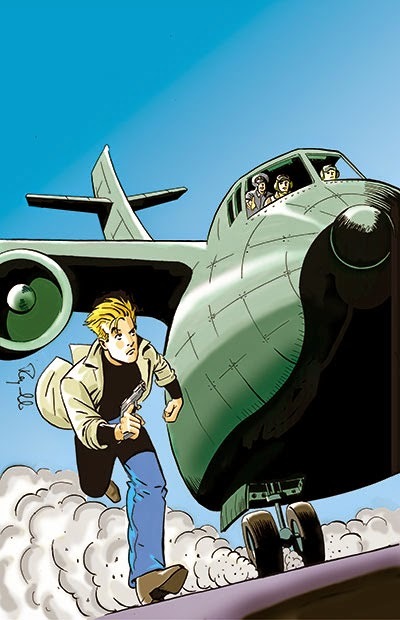 While the stories mostly focus on classic high adventure tales—other comparisons to the series are Jonny Quest, Indiana Jones and Tintin—I’ve also mixed things up by playing with other genres like comedy, romance and, as mentioned earlier, even sports! This reflects my own diverse interests in films and books, as well as the influence of Will Eisner’s Spirit, which showed that any kind of story could be told within the context of an adventure series. As one can imagine, over the years, the series has developed quite a rogues’ gallery of antagonists as well as a bevy of romantic interests. Chief among the villains is the mysterious Nicolai Korda, an international crimelord who Rob has encountered in the most unlikeliest of places, including Eastern Europe, North Korea, and China; Anthony Cromwell, a ne’er do well who will do anything and sell out anyone for a buck (the Cromwell’s backstory also provides a continuity connection with my favorite strip, Terry and the Pirates); a Chinese crimelord named Wo Chun Pei; Vojislav Bolkan, an Eastern European militia warlord; and a certain (late) North Korean tyrant has even appeared in the series to cause trouble for Rob! Rob’s adventures have taken him to Russia in search of suitcase nuclear devices; to Africa in search of a missing explorer; to Eastern Europe to help the U.N. protect fuel supplies; to Great Britain for a classic drawing room murder mystery; to the Middle East where he played a role in toppling a military regime; and even North Korea, where Rob was taken prisoner while investigating pirated goods and counterfeiting. He’s even gone undercover on a minor league baseball team to investigate steroid use, getting more caught up in trying to get a hit than solve the case! Among the beautiful women he has encountered are the forlorn Caroline Wilde, trapped in a loveless marriage with the self-centered opportunistic Anthony Cromwell; Isabelle Corbeil, a French espionage agent who often is at odds with Rob; Katya Vilnius, a doctor who travels the world for humanitarian causes, often bumping into Rob on assignment; and Tiffany Lance, a journalist from Find Magazine. 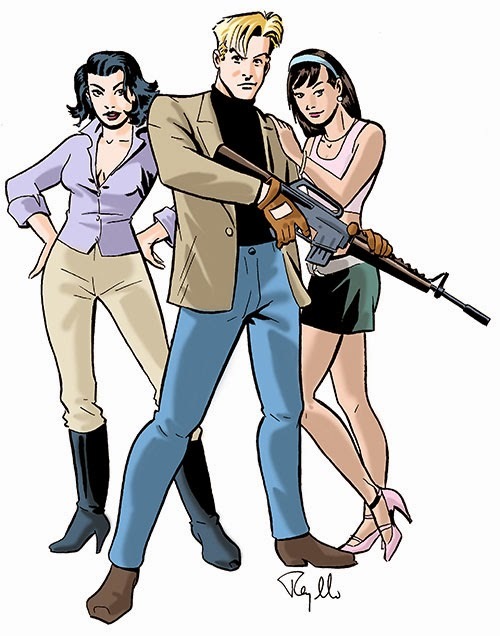 The agency of Justice International (also known as “JI”) and many of Rob’s friends and colleagues also are central to the series. They include Gabriel Evans Girard, the director of JI’s New York branch who first gave Rob his chance at the agency; Rob’s partner, Abner McKenna, whose main goal in life is to keep Rob (and himself) out of trouble; and his two main CIA handlers, Dennis Winger and Jarret Cox, who both depend on Rob while not completely trusting him. When I first came up with the idea of the worldwide detective agency Justice International, it seemed more fanciful than real, but history seems to have caught up with the series. Well known information and security firms like Kroll Associates, and mercenary organizations like Blackwater have gained notoriety in recent years, where “private contractors” have played increasingly visible and controversial roles in international hotspots around the world. Over this time, Rob has remained a bit of a blank slate, intended to be an everyman. The character in many ways is your classic adventurer—the perpetual underdog who believes in justice and fair play, who somehow always finds his way out of a scrape no matter the odds, against bad guys who usually have the upper hand. He often gets exasperated by the bureaucracy and entrenched Cold War worldview of his colleagues and handlers. 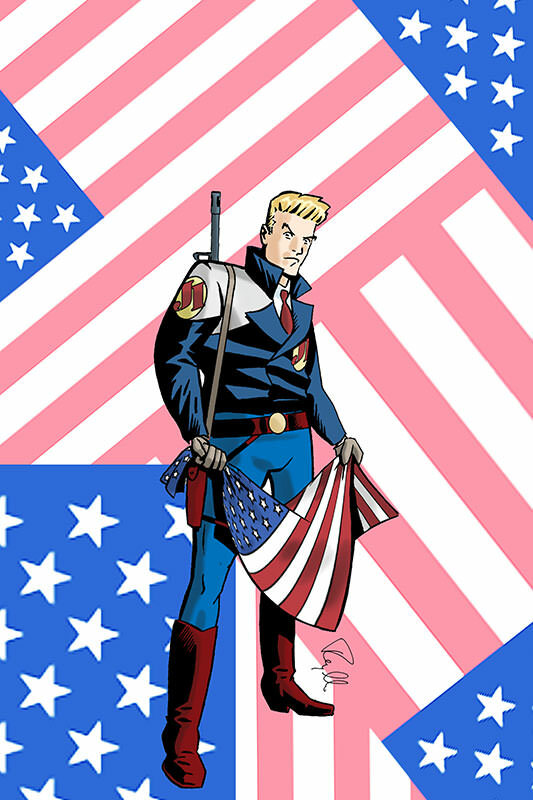 Though the character was always intended to be a sort of post-Cold War soldier of fortune, I created the character when the Cold War was still in full swing. Indeed, the character’s earliest stories include Rob grappling with Soviet and East German spies (“The Care Package” and “In the Company of Spies,” both collected in the Rob Hanes Archives). However, as a product of the post-Watergate generation, when films like All the President’s Men, Three Days of the Condor, and the Parallax View raised concerns about the trustworthiness of the government and establishment, I’ve always prided myself on taking a balanced approach to the politics in my “ripped from the headlines” adventure stories, avoiding the jingoistic approach that partly played a role in the decline of the classic adventure strips during the 1960s and after. As a result, when the Cold War ended due to the collapse of the Soviet Union and its eastern sphere, the transition of the series into a post-Cold War world was fairly smooth. In a dilemma familiar to many long-running series, the world has changed as Rob has remained pretty much the same age. As a result, I’ve begun thinking about the future of the series. Though I’ll be making an official, more detailed announcement in the near future, this 20th anniversary provides the perfect opportunity to re-introduce the series to new generations of readers with a “0” issue that doesn’t do away with past stories, but will re-set the series and refresh the character for readers and the realities of the modern-day world. Stay tuned for more about this soon!! As you can imagine, since the series debuted, comics and the comics industry have changed quite a bit—driven primarily by new technologies and media platforms, but also by changing tastes. When I began the series, the price of entry for an independent small press comic-book was pretty high: printing costs were close to prohibitive and the distribution system was still fairly closed to small publishers. It was pretty cool to be close to the ground floor of the self-publishing boom. Since then, digital printing and print-on-demand services have helped lower risks and costs; and the rise of the Web has offered new avenues for promoting, selling and distributing comics, both in print and digital form, outside of the traditional direct-sales marketplace. Even the way I produce comics has changed. In the "old days," every line on the printed page was on the original art: the art, the lettering, the word balloons, and the zipatone shading. My earliest covers were hand-colored using markers and I had to depend on my printers to drop in my cover logos. Today, of course, this is all done on my computer desktop in post-production—while I still pencil and ink much of the art, the lettering, coloring and shading are all digital. 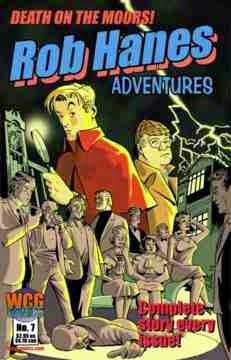 Nevertheless, let me assure readers that despite all these changes, so long as Rob Hanes Adventures continues, there will always be a print version that will always strive to capture the fun and magic of the classic high adventure comics that inspired me. Here's to another 20 years–and more! 10/00 1 Where in the World is Rob Hanes? I appreciate your enjoying the wide range of storylines I've tried to put in the series, which has kept my interest in it as well.